This popped into the Cycle Chic inbox today, from Sydney. It's a classic cycle chic poster advertisting the Sydney Festival First Night and encouraging people to cycle to and from the events. The festival night was held on 10 January. 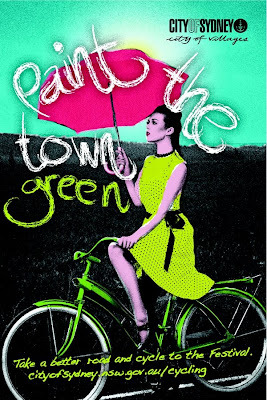 The poster lives on here at Cycle Chic. 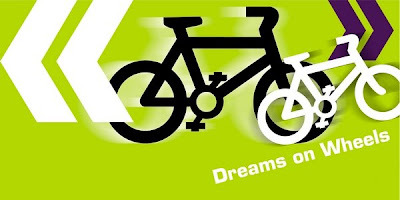 The Dreams on Wheels exhibition of Danish bicycle culture was seen by a couple hundred thousand people in the main Australian cities through the last half of 2008 and now the exhibition has morphed into a bigger and better version 2.0. It has been given wheels and will be rolling into Edinburgh later this month. You can see it at the Royal Botanical Gardens from 24 January to 21 March 2009. Here's some more info about the exhibition from Copenhagenize.com and here's some more info from the Danish Cultural Institute in Great Britain. If you love the photos here on the Cycle Chic blog, you can see them up front and personal at the exhibition since I did the photography. You can see Danish bicycles and learn about how we developed our bicycle culture. Dreams on Wheels will be visiting many cities around the world throughout 2009. I'll keep you posted. Nothing to do with bikes this, but it's a radio plague at the moment. A cool radio plague. Since this is a streetstyle blog, the line about "I want loads of clothes and fuckloads of diamonds" may ring true for many. What's going on with the photo competition? When the results will be posted? oh, the contest... damn. we'll get right on it. It is interesting that the poster shoes a woman with no helmet (hurraaay!!!). Australia has a helmet law ,does it not? the poster is cool, but she needs a helmet ;) the video is too cute.